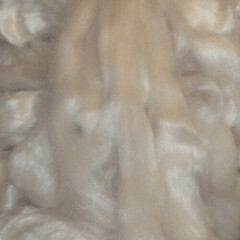 Stunningly shiny natural mohair is luxuriously soft for mohair and dyes up in brilliant shades. A perfectly delightful white/cream, this mohair comes in roving/top form for easy spinning. Great for spinning halo and fluffy yarn, wet or needle felting, and papermaking.Blend with wool to add strength and shine to sock yarns you spin. Available in my shop and etsy!